No one knows for sure the true origins of this little Chinese lapdog; however, they were originally sent to the Chinese emperor as a gift during the Byzantine Empire and kept by royal Chinese families during the Ming Dynasty. Some think that they were originally crossed between the Tibetan Lhasa Apso and the Pekingese. Shih Tzu is pronounced Sheed Zoo, Shid Zoo, or Sheet Sue. Shih Tzus are wonderful and devoted companions. They are happiest when they are with their family, giving and receiving affection. Good natured and friendly, they make friends wherever they go. Shih Tzus are well-suited to apartments in the city but are equally happy in the country. They love children and other animals. However, you must teach young children how to properly play with this tiny dog to avoid any unintentional injuries. Shih Tzus are often called “lion dog” as they were bred to resemble the lion. Shih Tzus usually weigh between 9-16 pounds and stand between 10-11 inches. They are sturdy and compact. Their coats are long and silky and come in a variety of colors. Because the hair mats easily, it does need to be combed out quite often. Most people like to tie up the long locks around the eyes into a bow at the top of the head. Sometimes this breed is called the Chrysanthemum Dog, a nickname originating from England that describes the way the hair on their face flows out in all directions. It makes them look like a flower with a little nose in the center. The Shih Tzu is the 2nd most popular dog registered with America's Pet Registry Inc. They are one of the 14 ancient breeds according to DNA studies, which makes it genetically close to the wolf. 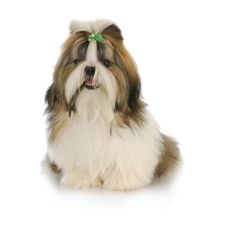 Famous celebrities who have owned Shih Tzus are Elizabeth Taylor, Brooke Shields, and Frank Sinatra.